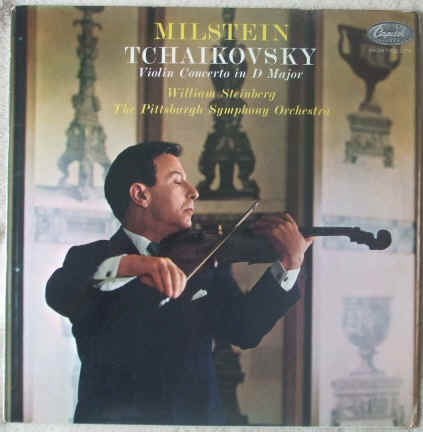 33rpm LP Record of P8512 TCHAIKOVSKY VIOLIN CONCERTO in D major, featuring Nathan Milstein on violin, accompanied by the Pittsburgh Symphony Orchestra conducted by William Steinberg. It was issued on the mono High Fidelity Capitol (EMI) 'Rainbow' label in 1960. UK pressing. The record itself is graded a strong very good, with a few visible light surface marks when viewed under normal house lighting. Play-tested on an AIWA turntable. Excellent sound quality, with NO jumps, ticks, pops or crackle. Just about faultless. Minimal spindle wear. Labels clean but with spider marks. The outer sleeve is graded at least very good, with some light rubbing to edges, bumping to corners, light foxing to back cover, very light ring wear, nothing at all drastic.